Accepted into a Juried exhibit! Two silk paintings of mine have been chosen to be in the OCAF 17th Juried Exhibition this year! You may recognize this design of Port Vendres - I’ve done two versions of this location. This one is on silk broadcloth which is about the weight of painter’s canvas. The silk broadcloth gets smooth and soft with washing, and the dyes lay down on the silk like some watercolors do on heavy paper - you can see the brush strokes, and the way the dye is taken up by the silk quite nicely. The painterly effect here is much different than what happens when dyeing lighter silks. The church was a wonderful discovery in a French town, Port Vendres, on the Mediterranean coast near the border with Spain. Notre Dame de Bonne Nouvelle -”Our Lady of Good News” is a fitting name for a late 19th century church whose town is a fishing and cargo port. I can imagine the women of the village awaiting the return of their loved ones from the sea and being so glad of their safe return that they prayed to Notre Dame de Bonne Nouvelle. The church faces the harbor, and I loved the idea of this amazing building inviting people to come in - whether it be by foot, by bike, by auto, or by boat. Teal City, the second piece that was juried in, is a fanciful place where color rules over order. I see this city bordering, again, on the waterfront, as Manhattan, NY or Sydney, Australia does. The colors are absolutely fantastic together, the material is the same heavy silk broadcloth. 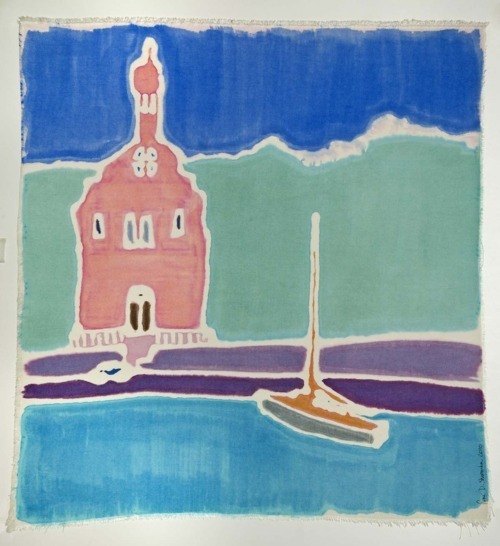 While Port Vendres is on the large size, at 29”x 26”, Teal City is smaller and intimate, at 4” x 9”. Both pieces are framed in a beautiful blonde wood frame, and with Teal City, the placement of the silk painting on the mat board within the frame is what inspired me to call it a ‘city’. It floats a little higher than the horizon line, giving me the impression that it is bordering on a body of water. It is an abstract design, totally about the relationship of the colors and shapes, but isn’t it true that all abstract art, when seen, is “read” by the viewer into their own understanding of what it is? Come by the OCAF gallery anytime to see the exhibit. The gallery is open 10-4 Tuesday-Saturday. The reception is this Friday night, April 6th, from 6-8 pm! I would love to see you there, and the collection of work displayed by all the artists will be very strong, I am sure. OCAF consistently attracts a great variety of local and national artists. What a fun evening event it would be to go to with a friend!